Included below are condos for sale in Coronado Shores. If you would like more information on any of these Coronado Shores apartment listings, just click the "Request More Information" button when viewing the details of that property. We can provide you with disclosures, past sales history, dates and prices of homes recently sold nearby, and more. And, if you haven't already, be sure to register for a free account so that you can receive email alerts whenever new Coronado Shores condominiums come on the market. 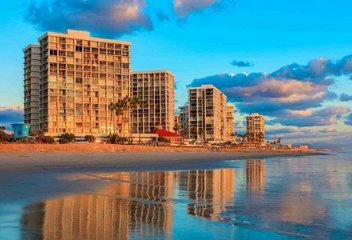 When searching Coronado Shores condos for sale you will find The Coronado Shores Association consists of ten, 15 story luxury oceanfront towers along 32 acres of Pacific shoreline. Located south of the Hotel Del Coronado, these condo towers were built in the 1960's and 1970s. Cabrillo, El Camino, El Encanto, El Mirador, La Perla, La Playa, La Princesa, La Sierra, La Flores, and La Palmas feature panoramic views of the Pacific Ocean, Glorietta Bay, Point Loma, Coronado Bridge, and city lights. The five beachfront buildings are La Sierra, Cabrillo, Las Palmas, La Perla, and El Camino with units facing the Pacific Ocean. La Sierra, La Princessa, La Perla, and El Mirador have a square shape whereas La Playa, Cabrillo, Las Flores, Las Palmas, El Encanto, and El Camino have a rectangular footprint. Coronado Shores amenities include a private beach club with nightly entertainment and a full bar with reasonable prices. Located under the Beach Club, The Coronado Shores Health Club is a full service fitness club with spa, sauna, showers, work out & weight training equipment with an attendant on duty. The Roeder Pavilion is an event venue for exclusive rentals located adjacent to La Sierra Tower. 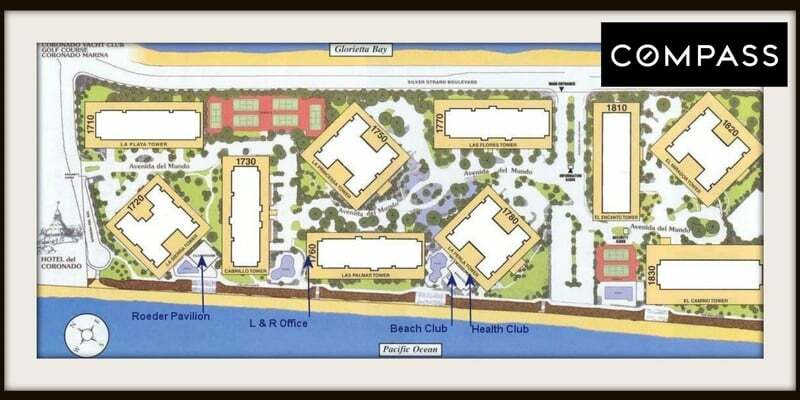 There are four beachfront swimming pools one adjacent to the beach club, one next to the El Camino tower and one next to the Cabrillo tower, and one along side the Roeder Pavilion. Coronado Shores has eight regulation tennis courts. Six are located between La Princesa & La Playa Towers and two are next to the El Camino Tower. Each tower has it's own condo association with common areas and facilities. Coronado Shores homeowners association fees include 24 hour concierge, common area maintenance, hot water, internal and exterior landscaping, external maintenance, sewer, basic cable TV and trash services. HOA Fees are determined by the board at the annual HOA meeting held during the 4th quarter of the year. South of La Sierra, Cabrillo Tower was the first of the 10 towers constructed in Coronado Shores and was completed in 1970. The tower is one of two towers that run perpendicular to Coronado Beach. Running parallel to the Pacific Ocean maximizing unobstructed views, the El Camino Tower was the fifth tower constructed in Coronado Shores and was completed in 1975. El Mirador Tower was the ninth condo tower constructed in the Coronado Shores and was completed in 1978. The panoramic views from the El Mirador tower range from the Mexican foothills to the skyline of Downtown San Diego located at 1820 Avenida Del Mundo Avenue. Located on the northeastern edge of the Coronado Shores, La Playa Tower was the 6th condo tower constructed in the Coronado Shores and was completed in 1976. It is southeast of the Hotel Del, directly east of La Sierra. La Princesa Tower was the 10th and last tower constructed in Coronado Shores and was completed in 1978. The 148-unit Coronado condo tower stands adjacent to Las Flores and Las Palmas towers. The La Sierra Tower is immediately south of the Hotel Del Coronado with 135 units. La Sierra Tower was the 2nd tower constructed in the Coronado Shores and was completed in 1973. Las Palmas Tower was the 3rd tower constructed in the Coronado Shores and was completed in 1973. Las Palmas is a superb 15-story luxury condominium tower that offers magnificent views running parallel to the Coronado beach and the Silver Strand. It stands adjacent to La Perla and Cabrillo Towers.